Yurok Tribe Celebrates Reclaiming Sacred Artifacts The Smithsonian Institution has returned more than 200 sacred artifacts to the Yurok Indian tribe in Northern California in one the largest repatriations of Native American artifacts in U.S. history. "Words can't explain how we feel," says Thomas O'Rourke, chairman of the Yurok tribe. "Today, when I thought about it, I cried." 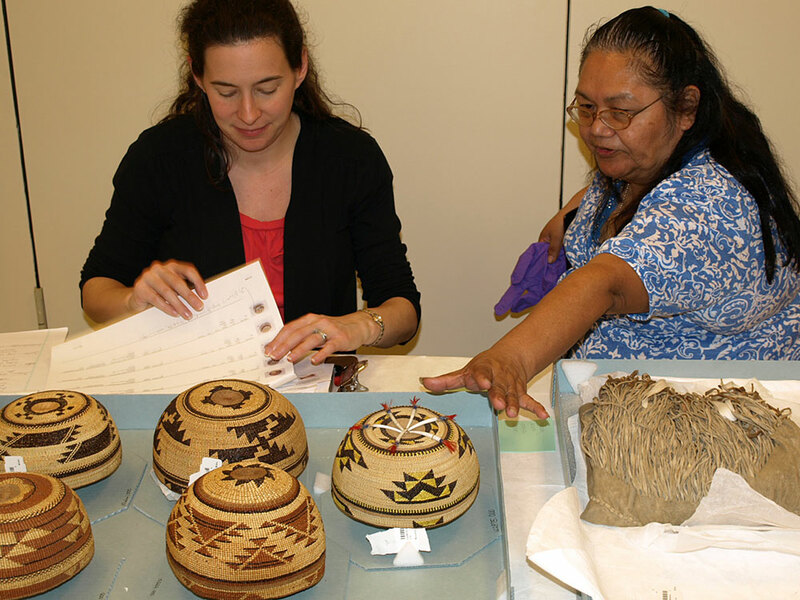 Rebecca James (right) discusses Yurok baskets with National Museum of the American Indian research specialist Cara Fama. The Smithsonian Institution returned more than 200 sacred artifacts to the Yurok Indian tribe in Northern California. The Smithsonian Institution has returned more than 200 sacred artifacts to the Yurok Indian tribe in Northern California in one of the largest repatriations of Native American artifacts in U.S. history. The Yurok received necklaces, headdresses and other ceremonial regalia that had been in the museum's collection for nearly 100 years. "Words can't explain how we feel and how I feel. I could say good, but it's more than good," Thomas O'Rourke, chairman of the Yurok tribe, tells NPR's Melissa Block. "Today, when I thought about it, I cried. They are key to our existence, to carrying on our traditions and our culture -- dances that we have taken part in since time immemorial." Words can't explain how we feel. ...Today, when I thought about it, I cried. O'Rourke says that the artifacts are prayer items made by their ancestors that are "very hard to come by." "These were brought in from New York," he says. "How they were separated from our tribal people, I believe that some of them were bought, some of them were taken. I can't rightly tell you how they left our people." O'Rouke says it took six years of negotiations to get them back. "Part of what took so much time was to determine which items belong to our tribe and which items belong to our neighboring tribes. The dances are very similar, and the regalia is very similar. So that was a slow, long process to have these items separated out." 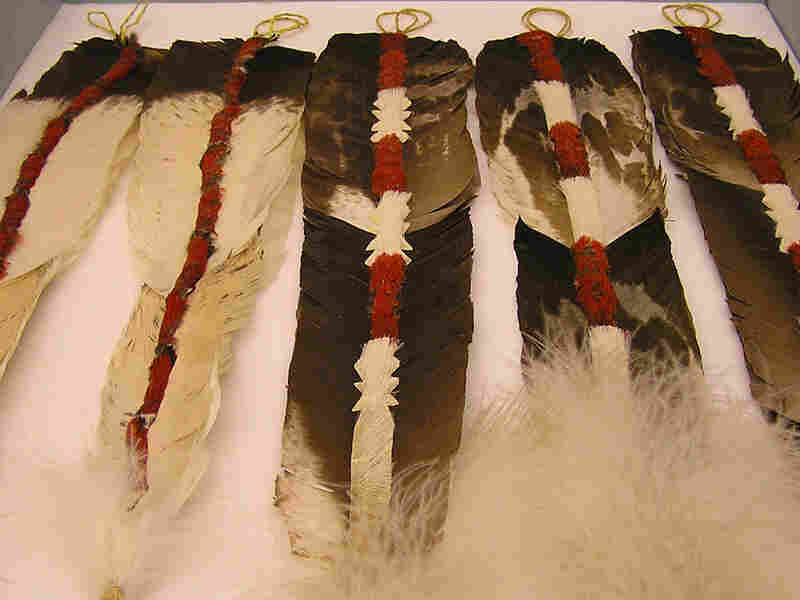 Condor feathers are ornately decorated for the Yurok tribe's jump dance. O'Rourke says he doesn't see the value of having the items in a case. "I believe that if people want to learn about our tribe, they should come visit us," he says. "We don't put our children on display in a case. We don't put our elders or our priest on display in a case. That's what these things mean to us. They're not something to look at; they are something that were made for doing a specific purpose in our world." O'Rourke says it's a joyous day -- much like welcoming home prisoners of war, he says. "We'll sing songs, we'll pray, we'll talk," he says. "And we will wake them up because in two weeks our renewal dances start, so we will prepare the items to dance. So they will dance this year."